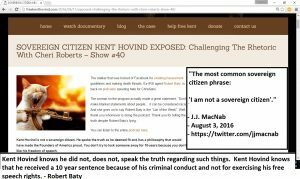 Cheri Roberts’ Broadcast On Kent Hovind – August 10, 2016 – Kent Hovind v. Robert Baty – The Great Debates! So, Kent and/or his people were listening! The stalker that was kicked of Facebook for violating harassment guidelines and making death threats, Ex-IRS agent Robert Baty, is back on podcasts spouting hate for Christians. The woman on the program actually made a great statement. And she goes on to say Robert Baty is the “Liar of the Week”. Well, thank you whomever is doing the podcast. Thank you for telling the truth despite Robert Baty’s lying. Kent Hovind is not a sovereign citizen. He spoke the truth as he deemed fit and has a philosophy that would have made the Founders of America proud. You don’t try to lock someone away for 10-years because you don’t like his freedom of speech – which is incredibly popular among Christians mind you. 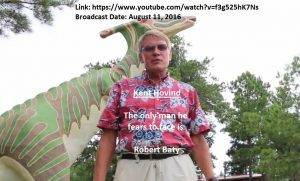 Robert Baty, Kent Hovind is not a sovereign citizen that doesn’t like the government. God gave us government for law and order… Just because people may have a certain philosophy doesn’t make them dangerous. Nobody is inciting violence or paranoia but you Robert Baty. Muslim extremists and government officials helping to launder money to ISIS, or use foundations for pay-to-play (like Hillary Clinton), are the true threat to this country… not law-abiding Christians who believe God is the ultimate authority and freedom giver – which is ironically what the Founders of America tried to establish but Believers in Jesus Christ as the TRUE God let a bunch of atheists and secular humanists in government. Robert Baty and friends are guilty of violating criminal laws. These people are the type of radicals that use inflammatory language that is dangerous. Robert Baty’s “sovereign citizen” paranoid schizophrenic rhetoric is no different than “Black Lives Matter” rhetoric in that it is racist. Blanket statements made against law abiding citizens who may have different philosophies in regards to what is true government authority, who are NOT VIOLENT, is a total disregard to civil liberties granted to each individual. Yes, some of the people claiming to be Christians have a different way of looking at law and order in America. Yes, they may have a strange idea on how to handle situations or use language we are not comfortable with. But many of the Patriots are not violent. Many of them are just tired of fraud, abuse, corruption and tyrants who are taking their freedoms away. Leave law-abiding Christians who just want to save souls to Jesus Christ alone. Don’t let Robert Baty and his crew make you feel insecure or wrong for being a law-abiding citizen who loves God and America. If you feel like you have been violated by these type of people, threatened, harassed or in other words intimidated like many others have – please call 9-11 and place a restraining order on them. You can read more about these type of people at “Robert Baty, Peter Reilly of Forbes.com and Randy Dunn Online Extremists“. Kent’s article referenced above has again been updated. Got to link for latest posted version.